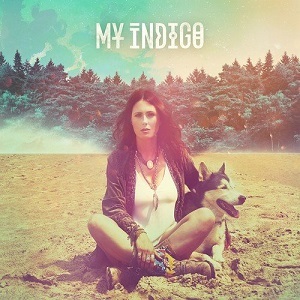 My Indigo is a solo project from Within Temptation singer Sharon den Adel. After going into the studio to write songs for Within Temptation and finding she was struggling to find inspiration, she decided to take a break. During that break she started writing again, but the songs she came up with were more personal and intimate than the songs she’s written with Within Temptation, and she found that writing them helped deal with things happening in her family life. The end result is a solo album, released as My Indigo. It’s got Sharon’s beautiful and distinctive voice that will be familiar to any Within Temptation fan, but the songs are very different – apart from having the more intimate feel, they’re not the powerful symphonic rock we get from Within Temptation, instead this is more pop oriented. The unveiling of the project didnt go too well – the Within Temptation site was blacked out and fans were told to expect an announcement from Sharon. The fact it was a statement from Sharon not Within Temptation led to massive speculation, and most of it was way off, with many fans predicting she was quitting Within Temptation. When they finally announced My Indigo the reaction was more relief than excitement (although fans did gradually get more excited after that). The album is very different to Within Temptation – it’s like the opposite side of Sharon. While Within Temptation is strong and powerful this is more personal and personal, but that’s not to say Within Temptation fans won’t like this. In fact I fully expect most Within Temptation fans to enjoy this album. The songs are quite varied but they’re all very listenable. The emotion in Sharon’s voice comes through clearly and gives an indication of how personal the lyrics are to her. “Lesson learned” is one of the most powerful songs on the album and wouldn’t have sounded too out of place on a Within Temptation album, whereas most others are quieter or more poppy. It’s a very good album though – maybe lacking that bit of magic to make it an amazing album, but still good. I’m sure if Sharon does decide to do another My Indigo album it’s going to be well worth listening to.